Alan Wall on Galileo’s Plank and the Shaman’s Pole. Galileo’s Plank and the Shaman’s Pole. GALILEO HAD A plank down which he rolled different-sized metal balls. He was questioning Aristotle, according to whom bigger balls should have reached the ground first. But they didn’t. All the balls, whatever their size, arrived at the same time. This was the plank of disenchantment, of measurement and close observation. When the balls reached the bottom of the plank, two thousand years of Aristotelianism died there and then, and ever since, experiment has taken over from scripture. Don’t take anyone’s word for it: Nullius in verba became the motto of the Royal Society later in that century, the seventeeth. ACCORDING TO MIRCEA Eliade, in shamanistic communities, the shaman’s home has a pole (sometimes a tree) which goes through the roof. During the ceremonies of initiation the shaman climbs to the end of this pole, thus establishing that he has journeyed to the extremities of perception, travelled where the non-initiated members of the community cannot go. He returns with a different level of consciousness, an ability to perceive and heal illness, an awareness of the realm of the spirits. He is now fully initiated. MUST WE CHOOSE one or the other of these as our axis mundi? We live, it seems, between the pole and the plank; between our continuing wish to be enchanted and our eagerness to disenchant the world through science (to know it as it really is, not as we would wish it to be). The question is put to us daily: which is it to be? But is it possible that the choice is a false one, like being asked to choose your left mental hemisphere or your right? Are we being told we must choose one side of the paper or the other? Maybe the pole and the plank represent complementary aspects of the human condition. Could they both be the expression of fundamental needs? To represent the world is to absent ourselves temporarily from it. We cannot be seamlessly situated in the present moment, and also be simultaneously situated so as to create a representation. The creation of a representation requires a separation from that which is represented; we cannot simply merge into the perception. We disengage from the present and absorb ourselves instead in what Max Raphael called ‘the means of figuration’.1 Here then the scientific and the artistic moments share at least one condition of existence: displacement from utter absorption in the sensuous moment. Were our earliest intellectual acts in fact moments of orientation? Did we have to remove ourselves from the sensuous continuum in order to situate ourselves intellectually in the world? Constellations may well have been the first moment of art and the first moment of science too. At that stage in human history there was no distinction between the two. What is interesting about the constellations is that they are both there and not there. It is our moment of perception, linking up the light of different stars from different times, which creates the constellations; and yet our astronomical charts are still filled with them. These gods, goddesses and mythical hunters populate the heavens. In constellations, the past and the present co-exist; different planes of reality are brought together to form mythic shapes. There is only one single plane upon which these realities co-exist, and that is the plane of perception. A representation is an exteriorization of perception, but also its negotiation into form; we make our marks upon the cave wall, and thereby project the perceptions we have of the world back on to the exterior world from which they came. In the process, they metamorphose. Our first attempts at science appear to have been primarily magical. There was no distinction as yet between the scientific and the manipulative impulse. We placed ourselves in a relation with nature where rain could be summoned, fecundity guaranteed, sickness and death averted, or wishes fulfilled. There was often built into these procedures and ceremonies an acknowledgment of the nature of reality, even where the impulse was to overcome it. For example, the rain dance demonstrates an awareness that rain is a necessity if crops are to flourish. Therianthropic masks worn by spiritual agents of various sorts acknowledge a physical strength in animals which is not present to anything like the same degree in humans. Herbs initially used for their magical properties proved themselves efficacious in some cases; ineffective in others. So through experiment a therapy began to take shape, even an effective one. Magic can measure itself by results, just as experimental science can. We can, if we look hard enough, find the rudiments of some of our present practices there: a doctor still takes something from the earth and gives it to the patient for ingestion into the body, so as to avert or palliate illness. Drugs go ‘on trial’, and when they are deemed efficacious enough we call them ‘wonder drugs’. We have undoubtedly shifted the nature of the correspondences, and their alignments one to another. With the demise of alchemy, we have looked increasingly to experiment and measurable results to dictate the nature of our science. Alchemy is the last moment when the magical is still permitted as a licit element of the genuinely scientific enterprise, and it is a moment that has a sort of afterlife in Newton, who would appear to have regarded force at a distance as an occult power, and who never gave up his alchemical experiments to the end of his life. Already the plank and the pole no longer seem so far apart. What is it that the shaman is doing when he climbs his pole? The word shaman is derived from the word sorcerer in the Tungus language. A shaman could visit the land of the dead; bilocate; assume an animal form. A shaman would undergo a psychic vastation, a journey across the valley of death, and only after that would his control of the spirit world enable him to perform curative acts. Like Dante, he must first undergo the terrors of the Inferno before the paradisal state might be witnessed and vouchsafed. The Contradiction of the Senses and Disenchantment. Nullius in verba: don’t take anyone’s word for it. Examine it; observe it; record it; experiment. Modern science tells us that what we perceive is untrue. It frequently contradicts common sense. It is obvious that a heavy object will fall to the earth faster than a lighter one, so obvious that Aristotle stated the fact and its factuality was accepted for two thousand years. 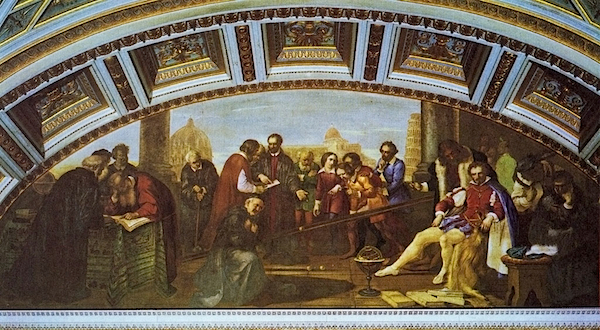 Galileo showed ‘the fact’ to be untrue by experiment and measured observation, science’s techniques of disenchantment. We do not sit on a stationary earth at the centre of the universe. This appears to be the case to our unexperimental senses, certainly. But science has established that we inhabit a tiny space inside an unimaginably vast one; that we spin around, although we do not appear to be doing so to ourselves; that the sun does not rise above our settled selves and then set later in the day, while our point of observation remains unmoving. The old perceptions that this is precisely what does happen continue their afterlives in our use of the words ‘sunrise’ and ‘sunset’. And then science really gets started in earnest. Not only are we not at the centre of our universe, but we are not even separated by the act of creation from the realm of the animals. We all have a common ancestor, so Darwin assures us. We name the animals, after all, they don’t name us, but it still turns out that we have all emerged from the same struggle for existence. And our sacred texts (such as the Bible) turn out not to be dependable accounts of how we got here, certainly not in ‘the literal sense’. 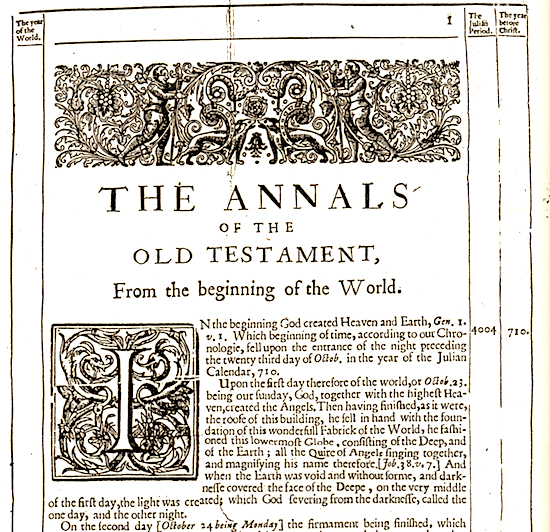 Bishop Ussher in the seventeenth century famously used the Old Testament to calculate the age of the earth. 4004 BCE was his confident assessment. But along came disenchanting science to assert that there was not enough time given to us here; the Book of Genesis was seriously short of time to get us to our destination, if what Lyell was asserting in Principles of Geology was to be believed. Once again the perceptions we have so carefully grouped into beliefs, the narratives we have created to account for our position in the scheme of things, find themselves contradicted by the juggernaut of enquiry we have come to call science, an activity that appears to move along in its progress without either taboo or sentiment, though it can certainly be abused, as it was in the Third Reich and Stalin’s USSR. There was a moment between the end of the eighteenth and the beginning of the nineteenth century when ‘the truths of religion’ and ‘the truths of science’ seemed to have found a possibility of merging. The one word which conjures this world most economically is ‘Unitarian’. The belief in a Creator and the belief in the truths revealed by science were not incompatible; indeed they would prove to be mutually self-supportive. Joseph Priestley’s experimentalism, or the combination of religious zeal and technological assiduity of some members of the Lunar Society, all seemed to confirm the possibility of a scientifically informed Christian religion. When Laplace asserted that he could ‘now dispense with this hypothesis’ (i.e. God) others were still holding on to the notion that they could now establish that same hypothesis as a founding truth for all scientific explorations. A commitment to determinism and causality meant that all phenomena, including the mental variety, would have to extend back in a logical and explicable chain to the Almighty’s originations; hence the burden of Hartley’s associationism. It is significant that Coleridge espoused both Hartley and Priestley and very nearly became a Unitarian minister at Shrewsbury. At that moment his radicalism in politics was matched by a radicalism in religion and philosophy. Unitarianism seemed to provide a deistic framework for belief which, by dispensing with miracles and the notion of Jesus of Nazareth as in some way supernatural, allowed for the free play of scientific enquiry. This moment of apparent reconciliation passed in a matter of decades, and has never returned. Instead, as the nineteenth century wore on, science seemed to deliver blow after blow to the cynosure of religious belief. Strauss’s Leben Jesu in 1835 effectively argued that all the supernatural elements accruing to the historical Jesus’s life, including the miracles and the virgin birth, were mythic additions, signs of respect inscribed upon the record of the life from worshipful disciples who came later. This did not need to trouble the Unitarians who had already arrived at their own similar conclusions. Lyell’s time-scheme for the geological formation of the earth made Bishop Ussher’s dating of creation risible. Darwin then came along to assert that there was no individual creation of species. Man was not shaped by Godly fingers, separately in the fastness of Eden, any more than the different species of finches on each separate island of the Galapagos had been made one by one, by a Creator finessing each of his makings in turn. The process of speciation through evolution meant that humankind did not have a privileged place in the scheme of things, except insofar as it had achieved this through a history of cunning and rapacity. We live not at the tip of a providential pyramid of blessings and provisions, but at the top of an invisible mountain of savagery and extinction. Fossils were starting to make this mountain more visible with every day that passed. By the time Einstein described himself as ‘a deeply religious unbeliever’ he was effectively saying that his commitment to scientific thought made it impossible for him to subscribe to any known religion; that what was asked of him in terms of credal subscription was not compatible with his intellectual integrity as a scientist. And yet. Why is this unbeliever ‘deeply religious’? Is Galileo’s plank once more asserting a certain identity with that other carboniferous axis, the shaman’s pole? In the Cave of Shadows. We are permanently negotiating with our own representations. In fact, any representation is a negotiation. Even those who believe Moses wrote the Pentateuch at God’s dictation must still acknowledge that a human hand was needed for the transcription. What is at stake is the ability of our representations to yield some kind of truth; or alternatively their potency to provoke falsehood and superstition. Some of the earliest known makings of humankind are the paintings on the walls of the Palaeolithic caves. These are undoubtedly representations, even if their purpose remains in dispute. Are they emblems of a form of enchantment? There is a kind of measurement going on, or we would not recognise today the shapes of the auroch and the bison. But the measurement is almost certainly instinctive. We know there were no aurochs or bison down there, so far underground, so our forebears were carrying an impression away and then setting it down; separating themselves from the sensuous moment. They (we?) were in one sense inventing a kind of history, if only a history of perceptions. Variegated perceptions have focused themselves into single images; we have resolved a complex of experiences into a single representation. We have negotiated ourselves out of immersion in the sensuous present. The cave-dwellers in Plato’s allegory do not realise that the light is projecting images of themselves on to a wall; they take their own secondary shapes as primary realities. They have generated their own phantasmagoria, then subscribed to it as a representation of reality. This will be known at a later date in history as ideology. An unbeliever faced with the Pentateuch and its supposedly divine authorship would have to say something similar: we mistake our own creations for Creation itself. We fetishize the making of our hands as gods. We worship what we ourselves have first brought into being. Do Galileo’s plank and the shaman’s pole represent different and irreconcilable worlds of experience? Are they both the totems at the centre of such different intellectual frameworks that they are frankly incompatible? One world represents itself through the Palaeolithic cave-paintings; and the other through a book like Sidereus Nuncius, which Galileo had printed in 1610, to demonstrate the discoveries about the stars and planets he had made through his telescope. Are these two modes of experiencing, observing, measuring and representing the universe and the life contained within it utterly incompatible, or might we perhaps try to think of them instead as complementary? Let us present ourselves with a melodramatic contrast. How can we reconcile the account of creation in Genesis with Lyell’s Principles of Geology? How could we reconcile the text that prompted Ussher’s dating of the world (using Genesis) to 4004 BCE, and Lyell’s requirement of vast periods of time for the terrestrial geological formations to have shaped themselves into their present forms? There could only be one possible reconciliation, and that is through a notion of form, and the specific creativity of form; a sense of the appositeness of types of representation to their specific functions. In speaking of cinema, Jean-Luc Godard likes to refer to ‘forms that think’. Each form, if it has any vitality, thinks in its own specific way. Genesis seen as what it is, a primitive cosmology expressed through Hebrew poetry, works very well. It can even be read as allegory. It cannot, however, be read as modern science. There was no modern science when it was written. To write or think as though Genesis could be ‘scientific’ in this way is an impossibility founded on a misunderstanding. The fact is that Bishop Ussher had bad reading habits. He had insufficient respect for the formal nature of the book before him, Genesis. He at least had some excuse, even though he did live in the same century which was later to create the Royal Society. Those who read that book today, and then create Creationist Museums in which life-size figures of Adam and Eve go walking in the garden with dinosaurs, have no such excuse. The development of modern science should at least have taught them that, whatever else Genesis is, it is most certainly not a record of ‘scientific’ observation or enquiry. How could it have been? Only if we do not understand that the Book of Genesis is magnificent Hebrew poetry, employing metaphor and parataxis, might we make the mistake of thinking it an alternative to modern science. If we do not realise that the Book of Revelation is a samizdat text, using symbols to express the oppression of the early Christian community beleaguered by a Roman hegemony, and expecting the end of the world at any moment, then we might start imagining that it gives an encoded version of our present reality, and permits us to predict forthcoming political events, including the terminus of history. If we can read Genesis and see it, in Godard’s phrase, as a form that thinks, and thinks very effectively within the terms of its own formality, then we have solved at least part of the problem. Such a reading cannot settle the matter of whether or not you believe in God, but it might at least solve the problem of what different sorts of writing are for; what sort of performances they enact as we read them. When Galileo went to see Cardinal Bellarmine, the Cardinal directed him to what we would call the text of Psalm 19, in which the sun is described as rising at one end of the heavens and travelling to the other. So Holy Writ had already established that it was the sun that moved about the sky, while earth remained stationary. The geocentric model must be true; the heliocentric one, false. None of Galileo’s experiments or observations with his telescope could disprove this, for a simple reason: if something is ‘holy’ in the Cardinal’s sense, then it is beyond proof or question. All contingency has passed from it. It inhabits an intellectual realm of pure and unassailable causality. It has become a different sort of narrative, a narrative that is beyond intelligent enquiry.3 The truth is, as Galileo was aware, his eminence the Cardinal had bad reading habits too; these extended in one direction to the Book of Psalms, and in another to Aristotle. Similarly, when a particular sort of reader points to the opening of Genesis and says that the earth was made in ‘six days’, that person has bad reading habits too. This, as we have noted, is Hebrew sacred poetry, not a treatise devoted to scientific measurement. Numbers and days are characteristically used to punctuate such a text, not to provide data for an experiment. And in any case what does ‘a day’ mean here? The Hebrew yom is flexible; it is a period of time. It can hardly be held to be twenty-four hours, for that would require the Almighty to be inhabiting the earth while He is actually engaged in the process of creating it. If He were gazing at the matter from Pluto, for example, then a day would be six and a half times the length of our own. But since He is presumably inhabiting the vault of heaven, then each day could take billions of years. This is how Jewish scholars have reconciled the account of creation in Genesis with Lyell’s geological time and Darwin’s biological long perspectives. Galileo was surely entitled, had he been feeling frisky, to explain to the Cardinal that if we have become so literal that every figure of speech loses its figurativeness, then God, according to the evidence of the Psalms themselves, would appear to be some sort of fowl, though an oddly martial one: ‘He shall cover thee with his feathers, and under his wings shalt thou trust: his truth shall be thy shield and buckler.’ Thus what we call Psalm 91. God is an armed dove. All methods of representation are formally shaped, and every mode of representation inevitably shapes and distorts according to the laws of its medium. Language, and in particular poetry, uses metaphor to convey as much information as possible as vividly as possible. But it is an act of illiteracy to expect every metaphor to ‘literalise itself’ through 360 degrees. Marianne Moore informs us that the swan ‘turns and reconnoitres like a battleship’. So where are the guns on its wings then, the naval crew, the living quarters? A metaphor finds its point of focus, a moment of similarity, between two objects, two beings, two realms, and discovers there a source of vivid imagery. The keels plough the waves. Why? Because keels and ploughs (both made out of wood in those days) enter the medium beneath them at an angle, cut through it, and leave a trace – either a wake or a furrow. And the men who stand above earth or sea direct the implement, as they go about their business: farming or warfare. Galileo’s plea was that the Bible was not the only book which was relevant, and that all books perform a particular function in language. The universe, according to Galileo’s The Assayer, was ‘written in a mathematical language’, which should be seen as being just as sacred as the sacred text. Galileo was arguing for the principle of complementarity, three hundred years before that principle was formulated by Niels Bohr. This is the greatest principle of modern physics, whereby the wave and particle characteristics of light ceased to be two warring principles involved in a zero-sum fight to the death, and became instead two aspects of the same reality. It is characteristic of a form of thought known as positivism, and sometimes scientism, to assert that all truths must be translatable into the terms of modern science; that anything encountered or recorded on journeys along the shaman’s pole must be translatable to, and testable upon, Galileo’s plank. We should at least note a curious dissonance here: Galileo himself did not believe this. The Bible might tell you how to get to heaven, he said, but it could not thereby tell you how the heavens work. Different ‘thinking forms’ think in different ways. Different forms provide different sorts of information. Their difference should not, however, be necessarily read as contradiction, but as a species of complementarity. If I ask you for a picture of your friend and you give me an X-ray, you are in one sense fulfilling my request. You are providing me with a truthful visual account of the person concerned, but you are being insensitive about types of information, and their thinking forms. You are simply not thinking enough about the way in which forms think. A Journey, Not Just a Measurement. In Shamanism: Archaic Techniques of Ecstasy,4 Mircea Eliade talks at length about the axis mundi, the sacred pole which, as we have seen, certain sorts of communities place at the centre of their villages, the centre of their world. It connects the highest and the lowest, connects up the realm of heaven with that of the underworld, humankind’s habitation being usually placed somewhere midway between them. This axis locates the community in cosmic space, situates it in what is otherwise a homeless homogeneity. Eliade discusses many different manifestations of this pole, employed to centre existence in the vastness of unwelcoming space. In certain villages, as we have seen, the pole goes right through the centre of the ceremonial house, exiting through the roof. The shamanistic figure, dedicated to the furthest explorations possible in the most far-flung realms, climbs the pole. This spiritual journeyer is then gifted with the ability to connect up heaven and hell; he can now make the ultimate journeys that the rest of the community is unprepared for, but needs to have made nevertheless – for solace, healing and spiritual information. It is an instructive and intriguing image, and a psychic pattern that recurs in many different forms in many times and cultures. We have noted how, in one sense, what the shaman does in climbing the pole, in the trance-like state of his initiation, is parallel to what Dante the poet does through his dream vision in the Divine Comedy: he visits heaven and hell and the regions between. He makes the ultimate journey and returns with the necessary images and information for the rest of the community to locate itself, to orientate itself within the totality of existence. Those Palaeolithic cave-painters must have been doing something like this. Poetry has often performed the same function. 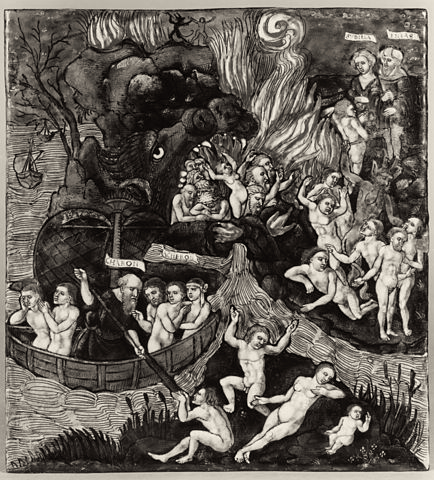 In Book VI of the Aeneid we have a descent to the underworld, and much Romantic and post-Romantic poetry involves visits to one sort of hell or another, counterpointed by just the occasional glimpse of paradise. Coleridge’s ‘caverns measureless to man’ recur with continued hallucinatory force in Baudelaire and Rimbaud. The earliest epic we have, Gilgamesh, contains a journey to the underworld. Human curiosity must touch the extremities of perception, even when they lie beyond death. The axis mundi locates the centre of existence, its truth. It places us at the still point at the centre of our phenomenological vortex. In comparison, Galileo’s plank can never offer anything other than observation and close measurement. It lets us conclude that F=ma, which is to say that any force can be calculated by multiplying the mass of the body by its acceleration, or the other way about. Watch closely and you will discover that gravity is evidently a uniform force, since objects fall at the same rate, whatever their size. If Galileo’s plank is about to become the new axis mundi, and so the centre of the world, so that all the central perceptions about the world are about to become scientific, subject to such forensic scrutiny and measurement, does this new scientific world of perception then constitute a replacement of myth, or does the myth simply evacuate itself to other, more welcoming, homes? What we are asking effectively is, what’s the story, since the Greek word mythos originally meant story. The world is about to grow larger, whichever axis mundi you employ. Galileo is about to look through his telescope and see an unimagined vastness. At that moment the axis mundi is his ‘optic tube’. It will soon enlarge and inform Milton’s imagination. But you cannot derive Paradise Lost from Galileo’s plank. Nor can you test its truth on that wooden surface. So, unless we are to dispense with Paradise Lost, we have to accept a fundamental difference between the plank and the pole. The shaman’s journey repeats itself over and over again, in many different cultural forms, and well into the age of modern science. Why does realism, having attempted to formulate itself as science in the form of Zola’s naturalism, then need to re-introduce the enchantment of the earlier narratives, and become ‘magic realism’? Perhaps we are continually exploring an essential aspect of our humanity, going back, as Lewis-Williams appears to imply, to our earliest psychic and cultural requirements. In the recorded accounts of his journey, the shaman, we have been told, mentally disintegrates. He undergoes a catastrophic collapse of identity. Another way of putting this is to say that the pre-existing structure of the psyche proves inadequate to withstand the destructive forces which are arraigned against it. Consequently, it must re-form and re-structure itself to accommodate the darkness of the quest’s encounter; thus will it achieve a kind of enlightenment. Enlightenment here involves not the exclusion of the dark forces, but their inclusion within the psyche’s economy. We incorporate the deadly powers. The plunge into the destructive element is liberating, as long as we survive the experience. This is shamanism, alive and well in nineteenth-century France. The dreadful journey will be made so that the shaman can return with news from the land of the unknown. He will bring the hidden treasure of occult knowledge. Rimbaud, as we know, was soon to abandon all this, and devote himself instead to a disenchanted life of trade. The fact is that, as a shaman, he was unemployable; which might make us pause when uttering the word ‘primitive’ about different sorts of societies. Bob Dylan, that life-long devotee of Rimbaud, has enacted his own shamanic journey in songs like Desolation Row and Isis. The world re-arranges itself amidst surrealist scenes of a nightmarish intensity. When the traveller returns to the world he left, its meanings have changed irrevocably. And so has he. Let the Plank be the Pole, and Vice Versa. Let us try an experiment then. Let the plank be the pole. Let it be the axis mundi. The silver balls may continue to roll down it, but it must also receive the shaman climbing up and down on the ladder of his dreadful journey. We live in an age of modern science, but Rimbaud’s poetic journey, or Dylan’s musical journey for that matter, cannot be discarded without a dreadful cost to our mind and our culture. (Einstein actually makes an appearance in Dylan’s Desolation Row – he is disguised as Robin Hood. Perhaps he intends to steal their preconceptions from those who find themselves all too richly endowed with them.) Let all of the knowledge of modern science branch out from this new trunk, but let us not pretend that the shamanic journey has somehow been superseded or rendered irrelevant. No one is disparaging the luminous equations, or doubting their efficacy, but one is entitled to point out that the entirety of human experience cannot be translated into mathematics. If I can respect the Book of Genesis and Sidereus Nuncius; see the point of both the Divine Comedy and Lyell’s Principles of Geology; if I can acknowledge the necessity for complementarity in physics, while realising that Desolation Row is a work as astoundingly potent as Robert Browning’s ‘Childe Roland’ (they in fact have many points of similarity), then it is because I acknowledge that each of these works constitutes a ‘form that thinks’. They are radically different forms, admittedly, and they have therefore done their thinking in radically different ways. The world requires of me at any moment a plurality of readings, readings that must be informed by the history of beliefs as well as the present state of science. But I do not have to believe Dante’s cosmology in order to acknowledge the immense potency of Dante’s poetry; I am surely permitted to make that adjustment. There is still sufficient play in the subtlety of the mind and its reception of forms for that. Different types of writing offer different types of truth. The Book of Genesis does not present me with a scientific problem, any more than Dante does; and the psyche still experiences the privation of its shamanic journey, even in our age of science; perhaps, particularly in this age. Time does not, in fact, make ancient good uncouth, despite the assertion of the famous hymn to the contrary. Truth comes in many different forms. One is entitled to celebrate these forms for the richness of their variety, the way in which they ‘think’, rather than merely engage in the usual exhausted routines of disparagement. Alan Wall was born in Bradford and studied English at Oxford. He has published six novels and three collections of poetry, including Doctor Placebo. Jacob, a book written in verse and prose, was shortlisted for the Hawthornden Prize. His work has been translated into ten languages. He has published essays and reviews in many different periodicals including the Guardian, Spectator, The Times, Jewish Quarterly, Leonardo, PN Review, London Magazine, The Reader and Agenda. He was Royal Literary Fund Fellow in Writing at Warwick University and Liverpool John Moores and is currently Professor of Writing and Literature at the University of Chester. He lives in North Wales. His poem sequence, Raven, has just been published as a chapbook by Shearsman Books and a collection of his essays is forthcoming from Odd Volumes, The Fortnightly Review‘s publishing imprint. This Fortnightly Review article is filed under the following rubrics: Clues & Labyrinths, Science, Medicine & Technology. Publication: Friday, 19 October 2012, at 12:11.